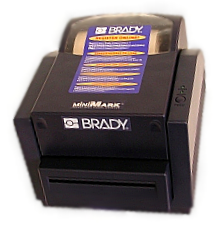 It is believed that the MiniMark was released by Brady in response to more affordable labeling options and customer demand. The MiniMark tries to be the "less expensive" option, and is positioned by Brady's marketing division as the "affordable sign and label making system". The MiniMark specifications reveal the shortcomings of the MiniMark label printer. Below are a few of these specifications, compared against the SafetyPro from ISS.